Plants in its natural habitat. Querétaro, Mexico. Altitude: Around 1500 metres above sea level. Habitat and Ecology: Strombocactus corregidorae grows in a disappearing habitat, where its low number populations are known from only three nearby localities. 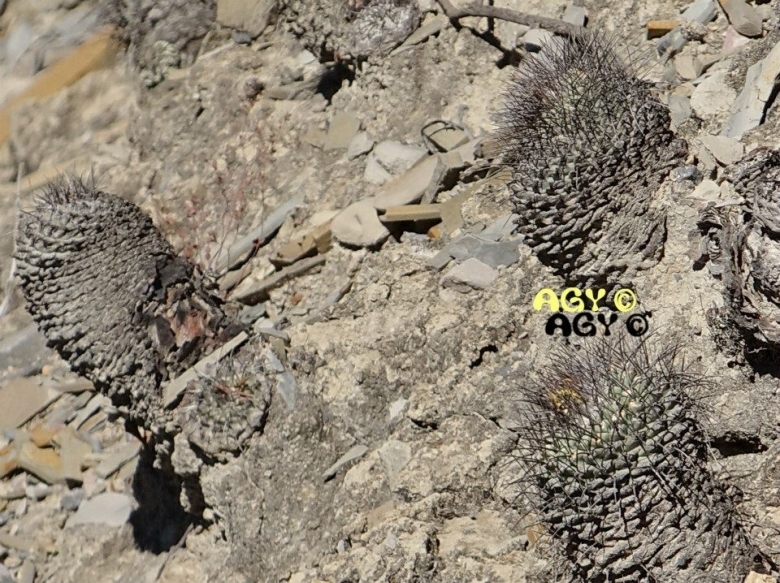 The same areas support endemic cactus species such as Aporocactus flagelliformis, Ariocarpus kotschoubeyanus, Astrophytum ornatum, Echinocactus grusonii, Echinocereus schmollii, Ferocactus glaucescens, Isolatocereus dumortieri, Lophophora diffusa, Mammillaria herrerae, Mammillaria scheinvariana, Mammillaria schiedeana, Marginatocereus marginatus, Neobuxbaumia polylopha and Neolloydia conoidea. 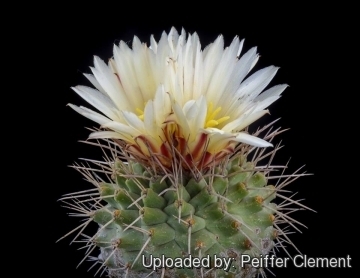 Description: Strombocactus corregidorae is a new species distinguished from Strombocactus disciformis by its massive bodies up to 25 cm tall. Spines: Stonge, thick, persistent, black-grey spines. Seeds: Whit with flat periclinal wall cells, finely reticulate micro-relief, hilum-micropylar region not covered by a strophiole. 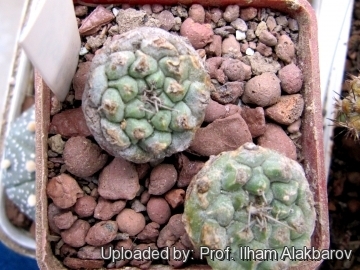 3) Sánchez Martínez, E., S. Arias Montes, M. M. Hernández Martínez and B. Maruri Aguilar “Strombocactus corregidorae from the Moctezuma River a new species and its vanishing habitat.” IOS International Organization for Succulent Plant Study <http://iosweb-org.> Downloaded on 26 February 2014. 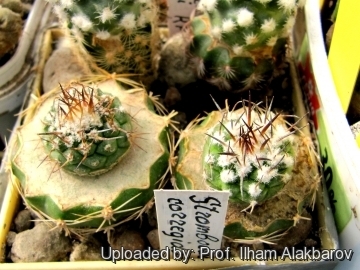 Cultivation and Propagation: Strombocactus corregidorae is relatively easy to grow, but very slow growing. It is often seen as a grafted plant but grows very well on its own roots too. Needs a very well drained mineral substratum with little organic matter (peat, humus). Requires strong sun to part sun to develop good compact growth and waterings should be rather infrequent, to keep the plant flat shaped and not become excessively elongated and unnatural in appearance. Use Water sparingly from March till October and keep perfectly dry in winter, or when night temperatures remain below 10° C (but some people give this plant a light monthly watering to prevent the drying and shedding of the lower tubercles.) It is hardy to -4°C (or less) for a short period. In the rest period no high atmospheric humidity!! Ensure a good ventilation. Propagation: Almost exclusively by seeds. But the seedlings are tiny and very slow growing and at first they take one or two years to reach the diameter of 1 mm!!! Once they have reached 4 years old or more they are relatively easy to grow, the problem is getting them to 4 years old! Than they reach 2 cm of diameter in about 6/8 years, and require very careful watering. Plants need 8 to 10 years to reach the flowering size. 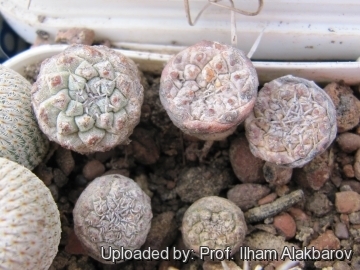 Plants are sometimes grafted onto column-shaped cacti, which is a much easier way of propagation than sowing.